The Feast of the Holy Apostles Peter and Paul is a holiday of one of the manifestations of the Holy Spirit in the Church, which we call the communion. When we hear this word, first of all, we think about the Communion of the Body and Blood of Jesus Christ. The communion that we receive, as the sacrament of the Church, is then expressed in the life of the Church for us, the heirs of Volodymyr’s baptism, the children of the Church of Kyiv. This feast means communion with the heir of the Apostle Peter – the Holy Father, the Pope of Rome. 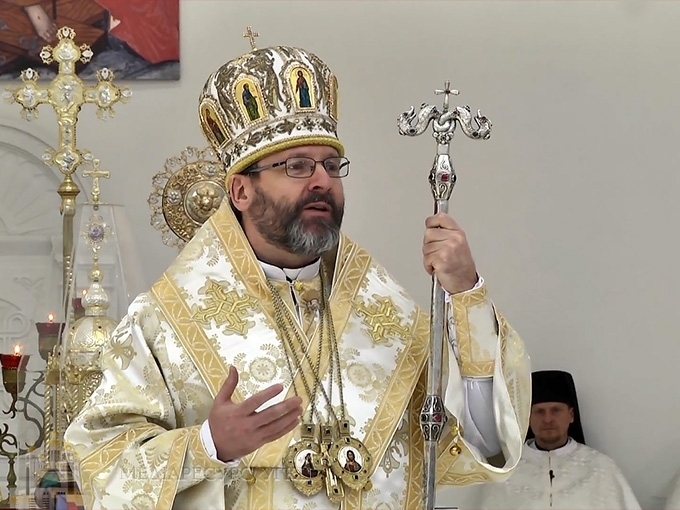 This was stated by the Father and the Head of the UGCC His Beatitude Sviatoslav at the end of the Bishops' Divine Liturgy on July 12 at the Patriarchal Cathedral of the Resurrection of Christ. The Head of Church coached Cardinal Leonardo Sandri, Prefect of the Congregation for the Oriental Churches, Archbishop Claudio Gugerotti, Apostolic Nuncio in Ukraine, Bishop Ivan Devčić, Archbishop of Rijeka (Croatia), Bishop Bogdan (Dziurah), Secretary of the Synod of Bishops of the UGCC, Bishop Joseph (Milian), Bishop Assistant to the Kyiv Archeparchy of the UGCC. The Holy Apostle Paul said that when one member suffers in the body, the whole body suffers. According to His Beatitude Svyatoslav, in this church communion, we feel today that with the patience and suffering of the Ukrainian people our Savior Jesus Christ suffers as well and is in communion with us: “Our Holy Father, Pope, suffers and is in pain and in communion with the pain of Ukraine. A visible sign of this suffering in the communion between the heir of the Apostle Peter, the Holy Father, and the UGCC is the presence of His Eminence between Cardinal Leonardo Sandri of us as a special papal envoy. “Look, today, we pray and partake of the only Body and Blood of Jesus Christ, not only the Papal Ambassador, not only the Apostolic Nuncio, but also the Archbishop of Croatia. The Croatian people know well what a war is, because until now he wears her wounds on her body. Today we are especially grateful that you, Your Eminence Ivan, arrived in Ukraine as a pilgrim, because the Roman Catholics of Croatia are suffering from Ukraine. You wanted to come here as a pilgrim on the way to Zarvanytsia. We congratulate you and thank you for this sign of church communion,” said the head of the Church. Then he turned to the guest from the Vatican: “I especially want to thank for those words that as His Eminence Cardinal Leonardo conveyed to us on behalf of the Holy Father. We feel that the Pope does not just bless us from afar, he loves us, prays for us, suffers and sympathizes, he is the voice of suffering Ukraine before the powers that be. At a time when the war in Ukraine becomes a forgotten, suppressed war, the Holy Father raises his apostolic voice and awakens the mind and conscience of Christians in Europe and the whole world. We feel that the communion, which today is embraced by the Supreme Apostles Peter and Paul, is a blessing for our Church and for the whole of Ukraine.